There are so many animation studios out there right now competing for Pixar’s throne that it’s almost unreal; whether it’s DreamWorks Animation, Studio Ghibli, Laika, Illumination, Blue Sky, Sony Pictures Animation, or the dozens upon dozens of smaller direct-to-video companies, everyone wants a piece of the glory, kind of like Game of Thrones but with cartoons. But Warner Animation Group, Warner Bros.’ new division dedicated to providing such content, doesn’t seem as interested in making a play for the big leagues (or at least, not as much as some of the other studios); instead, with their projects they seem to be trying to bring the era of animation back to its much sillier, more gag-heavy glory days, the kind that hasn’t been seen within the studio since the Looney Tunes. So far, they’ve had great success with films like The LEGO Movie, Storks and The LEGO Batman Movie while to date only making one that wasn’t quite as impactful (that still being The LEGO Ninjago Movie), and their latest film Smallfoot is a continuation of WAG’s ambitions for a brighter, sillier and much more colourful future in their animation department, even if it’s nowhere near as smart, insightful, or even as funny as some of their earlier films. Set above the clouds on a tall snowy mountain in the Himalayas, a Yeti tribe lives in harmony (sometimes literally so, as the movie is also a musical) with the belief that below them is a great big void of nothingness. That truth is tested when, one day, Yeti scientist Migo (voiced by Channing Tatum) comes across the fabled creature known as “Smallfoot” – which is just a normal human – and becomes determined to prove its existence to the rest of his tribe. 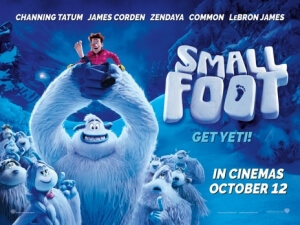 With the help of the secretive Smallfoot Evidentiary Society, led by Migo’s crush Meechee (Zendaya) who is also the daughter of the tribe’s chief (Common), Migo ventures down for the first time to civilisation to find and capture a Smallfoot, soon finding one in the form of Percy (James Corden), a TV personality desperately looking for a way to boost his failing ratings. It’s interesting, because the movie starts out like it’s going to be just another run-of-the-mill kid’s film, which doesn’t necessarily mean it’s bad but nothing too outstanding about it either, and it even has some of the similar story beats, characters, and jokes you would normally find in a film designed specifically for young children. However, when it reaches a certain point, the movie starts becoming a bit more defined and with a clearer sense of what lessons it wants the audience to learn, turning itself around in a way I wasn’t expecting and was thankful it didn’t go in the directions I feared it would. The decisions that characters make along the way are, for the most part, completely understandable and not thrown in to just designate someone into the villain role (in fact, without giving anything away, there really are no true villains here, just characters with different points of view that aren’t necessary right but still well-intentioned), and the morals it presents ring alarmingly true in today’s increasingly authoritarian world. There are things to it that are legitimately interesting, and I commend the film for at least adopting a slightly more mature attitude when delivering such drama and messages. I do wish, however, the rest of the film was as surprising, because up until that certain point, this movie is just filled with standard family movie stuff that, for a while anyway, prevents the movie from standing out more. There are lots of child-friendly jokes which involve slapstick and characters screaming or reacting to things in a very silly way, which is certain to get a few laughs out of them but for some of the adults in the crowd it may be a bit too much to handle; personally, I wasn’t sitting there annoyed by any of it, but more so just finding much of the humour not very funny, or the majority of the characters not very interesting or memorable. Previous WAG films had a far greater rota of gags on standby, and this film, or more specifically its script, does not hold a candle to some of the hilarious and often ingenious comedic writing those other films had. There are a few decent chuckles this movie manages to score, like for instance the fact that neither Yeti nor human can understand each other, but for every one or two there are about half a dozen other jokes that don’t even make it up to bat. Regardless of whether or not you’re laughing at a lot of the jokes that it’s trying to throw at you, it can’t be denied that it’s a gorgeous movie to look at; the environments are colourful and creative, the song numbers – which surprisingly are pretty decent, especially a rap number by Common which isn’t as corny as you may think it is – are accompanied by some lovely artwork, and the texture in both the snow and especially the fur covering the Yetis look alarmingly lifelike, even though you’re fully aware it’s all just a cartoon, but a beautifully animated one at that. Sometimes, you feel like you just want to put the movie on mute and just watch the pretty images go by on the screen, because the dialogue that’s being said, while not cringeworthy or anything, isn’t quite as funny or intelligent as some of WAG’s other successes. Really, the movie is designed for young kids to enjoy, and at the end of the day I think this is a perfectly fine movie to take them to; it’s got some good lessons, likeable enough characters, and some incredible animation for them to fawn over for an hour and a half. As for the parents or other adults in the crowd, you won’t necessarily have a bad time while watching this, but you will be thinking about the much funnier WAG movies you could be watching instead. Smallfoot is an amiable family film that doesn’t have as many laughs as some other films by Warner Animation Group, but it’s still got some good messages, especially in its second half, and some gorgeous animation to satisfy the young ones.